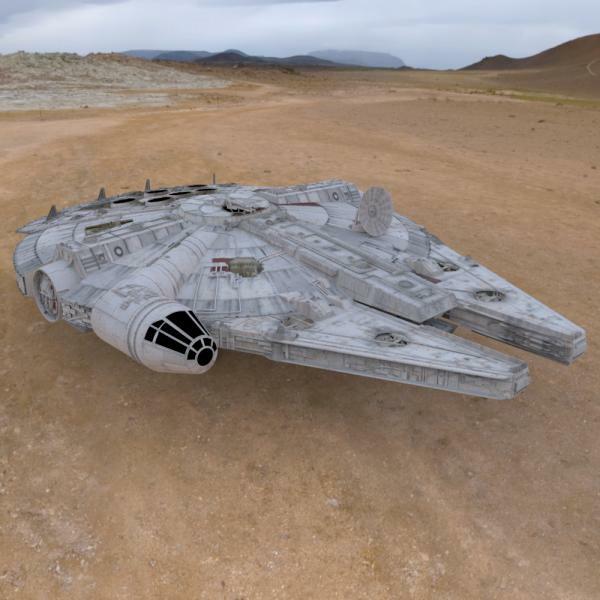 The Millennium Falcon for Poser. This version is from "The Empire Strikes Back" and was originally made by Andy Crook. This model is a rigged Poser figure and it's scaled to the size of the Poser people: about 34.74 meters/ 114 feet long. Entry ramp: up/ down, with an ERC dial on the Body. Landing gear doors: open/ close, with an ERC dial on the Body. Landing gear: up/ down, with an ERC dial on the Body. This model is meant for exterior shots: there is no interior and a very basic cockpit. This is a HUGE model, with over 528,544 polygons. We suggesting using a later version of Poser, such as Poser Pro 2010/ Poser 10 or above. Textured with texture maps only: all of the surface detail is modelled and no Poser shaders are used on the model. Texture maps range in size from 934x934 to 2000x2000, so you may need to adjust your render settings. thomasishp (3 years ago) Inappropriate? Very very cool. Works well in Poser Pro 2011 & Reality 4.
dogtor (3 years ago) Inappropriate? Looks good enough to make Lucas angry! Thanks. luego (3 years ago) Inappropriate? davlin (3 years ago) Inappropriate? locomotoro (4 years ago) Inappropriate? Just wonderfull. THANK YOU !!! Cool Work, well done! Thank you for sharing! SergeantJack (4 years ago) Inappropriate? OrionPax09 (4 years ago) Inappropriate? It works fine in DAZ 4.8, except for one serious problem. There's a problem with the doors for the front landing gear. I'm trying to fix it, but so far, no luck. Jonrerebel (4 years ago) Inappropriate? WolfKroger74 (4 years ago) Inappropriate? Vanishing Point: It eventually opened fine in Daz3, just took it about 10 minutes to process the OBJ, but it looks great, thanks again!! You guys say it runs fine in Daz4 and I believe it, I'm trying to open this in Daz3 on an older laptop, hence my problem! Works great for me in DAZ 4.7 too. WOW! Glad to say it worked in Daz 4.7 for me just fine. What a gorgeous model. Thank you for sharing this! Vanishing Point, Inc. (4 years ago) Inappropriate? Oops, spoke too soon, can't get this to open in Daz, chokes on the OBJ file, this is the first time I've had a problem with a VP model in Daz, disappointing, but such is life with Daz Studio! I'm impressed, the last 3D version of The Falcon posted here would cause my machine to freeze, this version will do just fine!! May the Force be with you! Cant wait to blow it up! Thank you very much! Looks awesome! roguemanx (4 years ago) Inappropriate? The Force is strong with this one! ;) Thank you! Missnancy (4 years ago) Inappropriate?